It has more powerful drive technology and a greater drop height. The new model replaces the AK 235 Profi model. 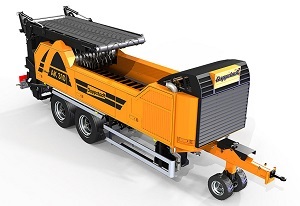 A new rear conveyor has increased the shredder's drop height to 3.5 meters, enabling it to produce bigger piles of processed material, or fill feed hoppers more easily. It meets the legally required Euromot Stage IV final emission requirements. A 3A motor variant is also available for new markets. The MTU 6R1000 228 kW (310 hp) diesel engine produces more torque, with constant driving power, while using relatively small amounts of fuel. The machine's drive train and engine have been designed to achieve more throughput, to suit the new types of work it is intended for.